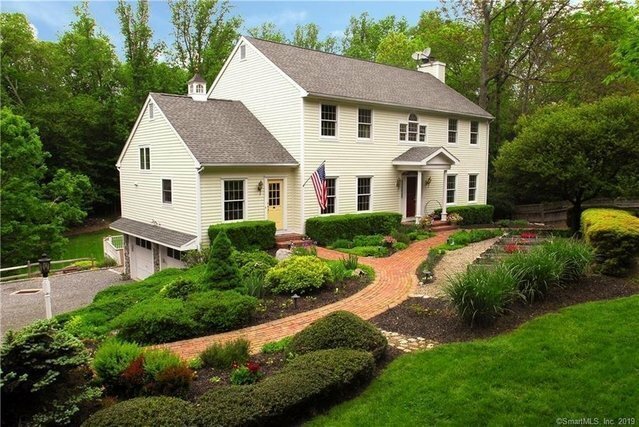 Spacious, light-filled Colonial built in 1992 with 9-foot plus ceilings, set back from Long Lots Road. Steel Beam Construction, four beds, 2.5 baths, three fireplaces, with two-car attached garage. Desirable and convenient location in the heart of Westport.Two-story center hall Colonial with marble flooring. Large eat-in kitchen with vaulted ceiling. Formal dining room, wood burning fireplaces in both family and living room. Master bedroom with walk-in closet and vaulted ceiling. Updated bathrooms with quartz counter tops and heated flooring. Walkout finished lower level consists of media room, office and gas fireplace. Finished on three levels.Fabulous two level deck looks out onto large private property.